Mahatma Gandhi was a well-known and influential Hindu man who lived between the years of 1869 and 1948. His childhood was experienced growing up in a strict Hindu sect, this greatly impacting upon his beliefs and values discovered later in life. Early on in his life Gandhi travelled to London to study law and did not return to India until 1915 (many years later and after working for Indian rights in South Africa). It was after seeing the discrimination shown towards his fellow Indians in South Africa that Gandhi first began a life-long struggle to improve conditions for Indians; both in South Africa and (primarily) India. Gandhi obtained his approach to the unjust treatment of the Indians from influences such as his upbringing, books of faith including the Ramayana, Bagavad Gita, the Bible and some contemporary authors and his own discoveries and philosophies gained throughout his life. These influences allowed Gandhi to understand that there were concepts that would help the Indian people to overcome their oppression, particularly from British rule, and also help them grow in their Hindu lives. The concepts that Gandhi strongly believed in and regarded as highly important in the lives of everyone, non-Hindu’s included, were those of: Non-violence, Satyagraha, Simple Living, Vegetarianism, Celibacy, Brahmacharya and Politics. Gandhi strongly believed in the idea of non-violence. His beliefs have been adopted into the Hindu religion and are widely considered both a development in the growth of the faith, as well as a physical expression of Hindu beliefs. 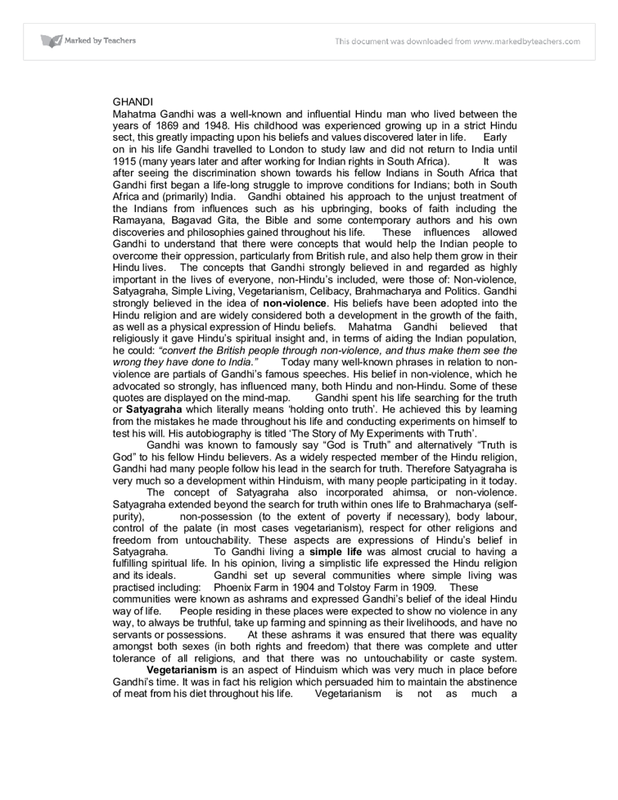 Mahatma Gandhi believed that religiously it gave Hindu’s spiritual insight and, in terms of aiding the Indian population, he could: “convert the British people through non-violence, and thus make them see the wrong they have done to India.” Today many well-known phrases in relation to non-violence are partials of Gandhi’s famous speeches. His belief in non-violence, which he advocated so strongly, has influenced many, both Hindu and non-Hindu. Some of these quotes are displayed on the mind-map. Gandhi spent his life searching for the truth or Satyagraha which literally means ‘holding onto truth’. He achieved this by learning from the mistakes he made throughout his life and conducting experiments on himself to test his will. His autobiography is titled ‘The Story of My Experiments with Truth’. Gandhi was known to famously say “God is Truth” and alternatively “Truth is God” to his fellow Hindu believers. As a widely respected member of the Hindu religion, Gandhi had many people follow his lead in the search for truth. Therefore Satyagraha is very much so a development within Hinduism, with many people participating in it today. The concept of Satyagraha also incorporated ahimsa, or non-violence. Satyagraha extended beyond the search for truth within ones life to Brahmacharya (self-purity), non-possession (to the extent of poverty if necessary), body labour, control of the palate (in most cases vegetarianism), respect for other religions and freedom from untouchability. These aspects are expressions of Hindu’s belief in Satyagraha. To Gandhi living a simple life was almost crucial to having a fulfilling spiritual life. In his opinion, living a simplistic life expressed the Hindu religion and its ideals. Gandhi set up several communities where simple living was practised including: Phoenix Farm in 1904 and Tolstoy Farm in 1909. These communities were known as ashrams and expressed Gandhi’s belief of the ideal Hindu way of life. People residing in these places were expected to show no violence in any way, to always be truthful, take up farming and spinning as their livelihoods, and have no servants or possessions. At these ashrams it was ensured that there was equality amongst both sexes (in both rights and freedom) that there was complete and utter tolerance of all religions, and that there was no untouchability or caste system. Vegetarianism is an aspect of Hinduism which was very much in place before Gandhi’s time. It was in fact his religion which persuaded him to maintain the abstinence of meat from his diet throughout his life. Vegetarianism is not as much a development within Hinduism as some of the other concepts of which Gandhi advocated so strongly. However its long-time presence and basis names it as a well-known expression of the religion. By rejecting meat from his diet Gandhi believed he was not only meeting his body’s requirements, but also acting economically; as meat was of a higher price than vegetables, fruits, grains, etc. Being a vegetarian was very much a spiritual practise of Gandhi’s and many other Hindu’s, but it was also a practical one. Gandhi’s decision to become celibate was greatly influenced by his father’s death and Gandhi’s past actions. He was highly devoted to his father and tended him as he suffered an extended illness. All through his illness Gandhi was by his bedside and the night he left to be with his young wife, his father passed away. This brought great shame upon Gandhi and, whilst still married to his wife Kasturba, he made the decision to become celibate. This act was also persuaded by Gandhi’s belief in Brahmacharya. Gandhi deeply believed that by abstaining from having sexual relations it would teach him to love rather than lust after his wife’s affections and throughout life itself. Gandhi’s life of celibacy can be considered a contribution to the expression of Hinduism. Celibacy was practised by Hinduism’s religious members but not as widely within the Hindu community. As celibacy was already a form of committing oneself to Hinduism it did not develop as a direct effect of Gandhi’s popularity. However the increase in numbers within the community who practised celibacy was contributed to Gandhi’s influence. Brahmacharya was made more widely popular through Gandhi’s personal experiences of it. Gandhi said in his autobiography that through his knowledge of Brahmacharya his body, mind and soul were protected. Gandhi’s practise of Brahmacharya greatly influenced his decisions of celibacy and vegetarianism. He said that as a Brahmachari, his food should be simplistic; consisting of grains, nuts, fruits and vegetables, and being uncooked whenever possible. As Gandhi was a highly publicised figure for Hinduism, his act of belief in Brahmacharya lead to the participation of many other Hindu’s. This heightened number of Hindu’s partaking in its ideals lead to the wider spread knowledge of Brahmacharya and therefore the acceptance that Gandhi had contributed to its expression as a concept of Hinduism. Politics is possibly the aspect of his life to which Mahatma Gandhi is most famous, along with his non-violence techniques. Gandhi was passionately intent on moralising the politics within his home country of India. He wanted to right the wrongs that had been committed against his fellow Indian’s but without committing any wrongs in return and for this he was a greatly respected and admired individual. Mohandas Gandhi contributed both to politics and Hinduism through his extensive knowledge of each. The philosophies he gained throughout his Hindu life lead him to be able to influence the ways of politics in India in a very unique way. His non-violent demonstrations are a particularly noticeable example of this. Gandhi’s participation in the politics of India gave great insight into the expression of Hinduism, primarily through his non-violence theories and demonstrations. The Hindu religion was expressed through Gandhi’s involvement in politics in his theories and demonstrations of non-violence and his periods of fasting. The salt march of 1930 is an instance where his philosophy of non-violence and tolerance was shown, you can see the picture on the mind-map, and there were many occasions on which Mahatma Gandhi would cease eating, claiming he would die before consuming food again for whatever cause he considered noble at the time. 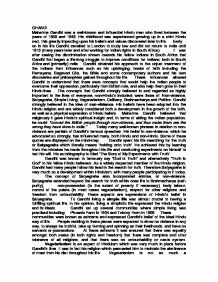 In conclusion, through the concepts of non-violence, Satyagraha (is a philosophy and practice of non-violent resistance), simple living, vegetarianism, celibacy, Brahmacharya and Politics it can be seen that Mahatma Gandhi played a very influential role in the lives of many Hindu and Indian people in the 20th Century, contributing to both the development and the expressing of the Hindu religion. He wasn't present it says so (verse 3). "Who can swear" is saying that no-one knows. This phrase is implying that it doesn't matter. I do agree to this at an extent. I believe it is not the most important thing in a religion the story of creation. People began to realise that a powerful extremist wing had formed in India, it was recognised by characters such as Jawaharlal Nehru (future prime minister of India) and Subhas Chandra Bose, it is unlikely that any man other than that of Gandhi's attitude and character could have controlled these men. Put his life to an end with three pistol shots. As the first bullet struck, Gandhi's foot, which was in motion, descend to the ground, but he remained standing. The second bullet struck; blood began to stain Gandhi's white clothes. Gandhi murmured. "Hey, Rama (Oh, God)." A third shot happened. The official figure of the number of people killed in the recent violence in Gujarat, the vast majority of whom are Muslims, is in the range of 850 to 900, but unofficial and more reliable estimates put the figure at somewhere in the range of four to five thousand. The activities of the temple revolved around the worship and celebration of the god through an image or statue. Temples were also used for religious festivals, which involved processions with the god transported on a barque, a scale model of a boat carried aloft on poles. shuttle bus service that takes passengers up to the Cantonment; alternatively, you can hire a taxi. Varanasi's main railway station is the junction station near the cantonment area. It is about 3 kms away from the old city center and can be accessed on auto rickshaws or cycle rickshaws.